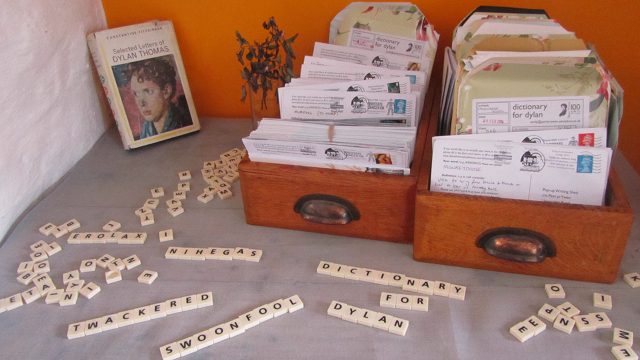 Today’s guest post comes from award-winning poet Emily Hinshelwood, and offers details of her Dictionary for Dylan project, shares her passion for words, and invites you to get involved. 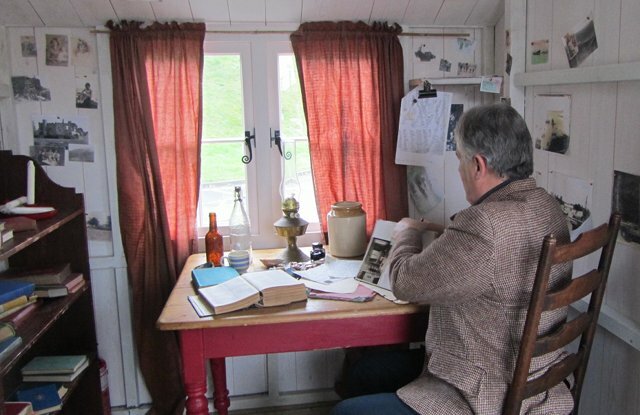 When I was invited to be the writer in residence in one of this year’s centenary projects, The Dylan Thomas’ Pop-up Writing Shed, I knew I wanted to do something that enjoyed words and involved people in playing with them. Dylan Thomas crafted his works with such skill and dedication that this seemed to me to be a fitting tribute to a man who had lived for and loved those black and white shapes. I also wanted to encourage people to explore their own use of language, and not to feel restricted to using words as they appear in our dictionaries. So I decided to invite people to invent entirely new words and their associated meanings. It’s something that anyone of almost any age can do – and at the end of the year I’ll be compiling the words into a Dictionary: The Dictionary for Dylan. 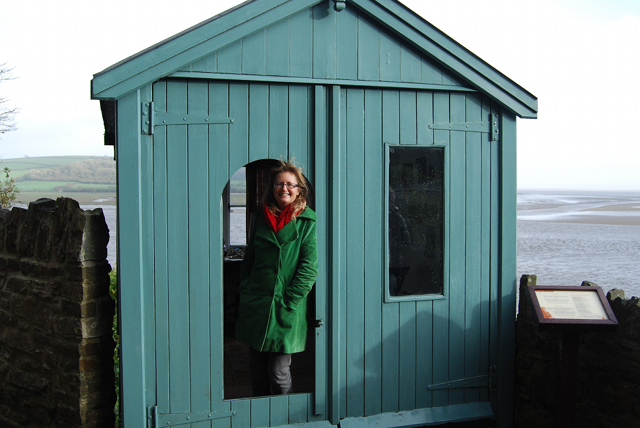 The pop-up writing shed is a replica of Dylan’s iconic shed in Laugharne where he worked for the last four years of his life. It has been faithfully re-created down to the curled pictures on the walls, the cigarette butts, the beer bottles on the desk, and his jacket on the back of the chair. And it’s on wheels! 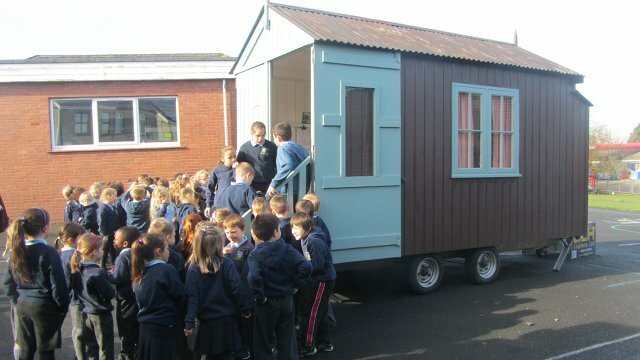 So since February I have had my head in the shed, visiting schools and festivals, talking with people about Dylan Thomas and being witness to the birth of literally thousands of new words. People’s eyes light up when they hear that their word will go into a dictionary. Often it is a family word that they’ve used for generations, or a word one of their children coined when they were learning to speak. Some people make an anagram their name or splice two words together, or do what Dylan did and write them backwards. There are those that give me the detailed etymology of the word, those that produce onomatopoeic words, those that give multiple definitions. And so far I have not had the same word twice! I’m delighted with the response, the imagination and the hwyl with which people are embracing the project. (in case you were wondering, hwyl means ‘stirring feeling of emotional motivation and energy’) And it’s not restricted to people who come into the shed. We have an online form and a postcard for people to send me their words. Marvel at what rolls in! I find it fascinating the different kinds of words people invent. In primary schools they are often about superpowers and magical creatures, the world with infinite possibilities; in secondary schools there seems to be a lot of words that reflect teenage anxieties, the loss of friends, or being hurt by gossip; then there are all the situational words, eg in Hay Festival (pictured above) there were plenty of words about mud and waiting around too long for friends! If you would like to contribute a word to the dictionary, please do send it to us via the online form at www.dylanthomasboathouse.com/dictionary-for-dylan, and keep your eyes peeled for the shed. It really is popping up all over the place! Emily Hinshelwood (pictured above) is a freelance writer, performer, animator and community arts facilitator. Winner of the John Tripp Award for Spoken Poetry, Emily performs her poetry in a variety of settings, from outdoor poetry walks, to the sitting rooms in IKEA, to sustainability conferences as well as traditional arts venues. Her recent poetry collection, On Becoming a Fish was inspired by a series of walks around the 186-mile Pembrokeshire coastal path and took seven years to complete. She has won many literary awards for her poems and is especially interested in engaging audiences with poetry. Emily also runs a programme of Arts and Climate change projects for the charity Awel Aman Tawe, which engages people in the issues of climate change through a variety of arts genres. This entry was posted in Writing genres and tagged Dylan Thomas, Emily Hinshelwood, literary projects by Judy. Bookmark the permalink.